A very interesting article in todays Canberra Times titled 'On the road to nowhere' about the expense of our current public transport system, and the recent proposed changes to it. It talks about urban density, increased ACTION service frequency, and the need for light rail. One of the academics correctly picks up the fact that unless there is a funding model created, then there is no 'plan' for light rail. Another falls into the 'not now, but perhaps in twenty years' lazy thinking trap. 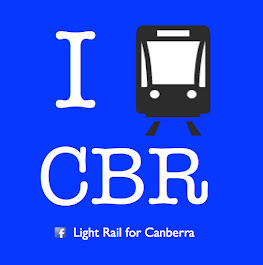 ACT Light Rail have long called for the ACT Government to show real leadership and explore funding models to construct and operate at least one light rail route. This would cost about $200 million, over 3 to 5 years. This is not an outrageous sum in infrastructure terms. This sort of money can always be found for more roads - but never for public transport. The ongoing cost of ACTIONS service is around 90 million a year - which results in the real cost of every trip taken being $6.50. The government has it half right - by trying to improve the current network and increase service frequency. They need to focus on the other half - a proper mass transit technology - light rail - and a funding model to build it.